Last Term at Malory Towers first edition dust jacket by Stanley Lloyd 1951. 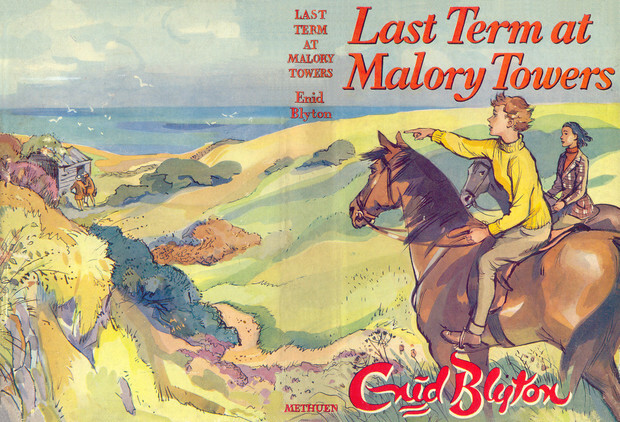 The Last Term at Malory Towers is exactly as it suggests, the last book in Enid Blyton’s fabulous (and much loved) school series. In this novel we spend Darrell’s last summer term with her. We left her at the end of In the Fifth at Malory Towers enjoying the applause of her first efforts as a play writer, and it seems a lot has happened in the year since we last saw her. This time around our heroine is Head Girl of the whole school a feat I’m not even sure she dreamed of when she was in the lower school. Her best friend, Sally Hope has become Games Captain of the whole school as well, making a dramatic change from when she was in the first form. We’ve got the usual gang with us for this last term, with the exception of Mavis (the opera singer) and Catherine Grey (the pious girl from In the Fifth), but to make up for it we are introduced to two new girls. One is a French girl called Suzanne, she is never given a second name but we are told that she is Mam’zelle Rougier’s niece so it can probably be assumed that Suzanne’s last name is Rougier (unless anyone has proof of that not being true). The other new girl who causes more of a stir than Suzanne is Amanda Chartelow (introduced to the girls as Amanda Shoutalot by Mam’zelle Dupont, but that’s not surprising to those of us who know Mam’zelle and her ways). We see a lot more of Amanda in this book than we do of Suzanne which is slightly odd for Blyton’s Malory Towers books not using the full potential of both new characters. Another difference in this book is how much time we spend with the second form, with Felicity Rivers, Darrell’s sister and June Johns, Alicia’s cousin. This has left people wondering if Blyton ever meant to go back to Malory Towers and tell her readers what happened with the next generation of the Malory Towers girls. While we dally with the second form, we are also introduced to Josephine Jones a.k.a Jo, who is, as Miss Grayling puts it, “One of our experiments that does not seem to be working”. Throughout the book it is emphasised that Jo would turn out alright if she had the backing from her parents which as you can see in the half-term chapter, she does not get. There are maybe four main threads to follow in the Last Term, one to do with Gwendoline Lacey and her insistance that she is going to a Swiss finishing school and the row she had with her father over going becomes a long thread throughout the book. The second story thread would have to be the new girl Amanda (who comes from a famous sports school, until it was burnt down) and how she decides to teach a single second former to play tennis and swim to perfection which causes fights and controversy throughout the school. Amanda also decides to do some very foolish things when it comes to her own swimming, adding drama to Darrell’s last term. The third theme in the book has to be the one connected with Josephine Jones and her friend in the first form Deirdre. Jo is rather unliked by the second form because of her continual boasting which causes her to take Deirdre under her wing and cause all sorts of problems. The fourth and final part of the story, is a lighter one as it involves one tremendous trick that the second formers decide to play on the sixth formers after they have taken their Higher Certificate. The trick is cleverly planned and played to perfection in the same way that the tricks in the past have been played. And once again, Mam’zelle is the perfect person to play it on! After that, it’s with a very heavy heart that we finish Darrell’s last days at Malory Towers with her. It’s been a spiffing six books in that wonderful school and we, along with Darrell, Sally, Alicia, Mary-Lou, Irene, Belinda, Betty and all the others, have enjoyed every second (well almost, but lets gloss over those unfortunate times when Darrell lost her temper and people were rather silly). Such a summing up moves me to tears (or that might be because I’m ill – I’m not sure!) and it’s terrible because you don’t feel like you’re finished at Malory Towers, but as it is at least we can go back and re-read all the books, looking for missed details and laughing with the girls again. Last Term at Malory Towers isn’t one of my particular favourites. I love the nostalgia that Sally and Darrell get, and I just wish that we could have spent a bit more time with them in their last term rather than with Amanda and the second formers. I do adore the trick however, it is one of the best. I just dislike that it’s the end! So that’s it for my Malory Towers reviews! There are more books, written by Pamela Cox but unfortunately I could not get on with the style in which they have been written. 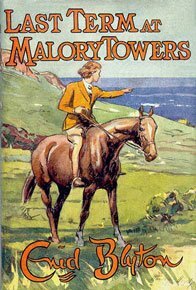 Maybe in time I’ll get around to reviewing them, but for now, we need to say goodbye to Malory Towers and just know that we’ll see it again soon! All Pictures Taken from the Enid Blyton Society Cave of Books. This entry was posted in Book reviews and tagged Darrell Rivers, Felicity Rivers, Last Term at Malory Towers, Malory Towers, Sally Hope, Tricks. Bookmark the permalink. It seems that Malory Towers had a special place in Enid’s heart – perhaps relating to some happy memories of her own French teacher. Nice review – glad you felt an attachment to these stories as I am sure Malory Towers had a special place in Enid’s heart. I believe she herself was very fond of her French teacher. Good book, but why is Darrell head-girl and not Sally? As Sally is a personal favourite of mine, I have often wondered the same thing. Sally is much more Head Girl Material, whereas Darrell always showed a keener interest in sports. I suppose Darrell became Head Girl because the series is rather more about her than Sally, and with Sally not really being developed as a character beyond The Upper Fourth, we can only assume that to Blyton, Darrell was the obvious choice. I thought that I wouldn’t be the only one hit by the last sentence. Blyton rather liked bittersweet at times. She also did this at the end of the Fifth.